In financial year 2017, YOC Group recognised EUR 14.4 million in total revenue (2016: EUR 12.0 million). This corresponds to an increase by around 20 % year-onyear. 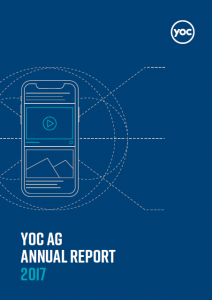 The successful transformation of YOC Group into a mobile premium programmatic provider has improved the group’s earnings situation both on the side of revenues and of gross profits. The group’s total output was EUR 2.5 million above the previous year’s level at EUR 15.0 million (2016: EUR 12.5 million).